As has been our tradition, Linda and I took to the skies on Christmas day so we could visit family in New Hampshire. This year, when exiting the plane, Linda made it a point to thank each employee we walked by for working on Christmas. It’s a sacrifice that MANY people make in the hospitality and entertainment industries, and one that often goes unrecognized. It was great seeing their faces light up when their sacrifice was acknowledged, but the smiles on the employees faces were nothing compared to the smile on Linda’s face. By the time we got to the terminal, she was grinning from ear to ear, on the verge of giggling. There was a spring in her step and a palpable air of confidence and satisfaction. Why was she so happy? I don’t know the exact science behind it, but praising others feels good. Maybe it’s because we know what it’s like to RECEIVE praise that spreading the sunshine to someone else makes us feel good for being a part of the process. Whatever the case, this experience showed me that we should talk about this more – about how praising others is as good for the person we are praising as it is for us – and it stands to reason. Many years ago I heard T. Scott Gross saying that the things people do generally fall into two categories: either we do things to feel good, or do things that won’t make us feel bad. Ultimately he was talking about customer service, but I think the psychology applies here as well. Many people shy away from praising others because they don’t know how to do it, they don’t want to appear to “favor” someone, or they don’t know what an impact it can have. Typical “I don’t want to feel bad” type of thinking. Problem is, you have now made the employee feel bad because they could feel ignored or under appreciated. Oops. What if you made the choice to feel good instead of not feeling bad, and praised the next person you see doing something good? Wouldn’t we all benefit? It’s never too early to start thinking about how to prepare your leaders and employees for the upcoming season. I’m happy to help get the ball rolling! As we approach “thank you note” season, I thought I’d share an experience that gives some insight about what NOT to do! A few weeks ago, I was ordering something over the phone. The order became sort of complicated, and probably took much longer than the average call. I had some very specific questions that required both myself and the associate, Lisa, to research before the order could be completed. In the end, the order was completed properly, and I have to say that Lisa handled the entire process VERY well. About a week later, we got a card in the mail from that company. Upon opening it we found a hand written note from Lisa, thanking us for our order, and the note even included a few details of our conversation. Sounds good, right? What’s the problem? The card was addressed “Dear Linda” (my wife), when it was me who spent over 20 minutes on the phone with Lisa. It’s true that Linda has an account with this company, and we had even put the order in her name for simplicity, but Linda never spoke to Lisa. Is this a big deal, when everything else went so well? I kinda think it is. You could argue that Linda is the account holder and it went to her because of that. I would counter that argument with this: If this company is REALLY trying to make a personal touch and show an interest in the consumer experience beyond the sale, they need to get ALL of the details right, which starts with knowing who you are are talking to. For most people, there is nothing more personal than their name. It represents who they are and it identifies them from the crowd. Unless they have changed their (first) name for some reason, it’s been with them their entire life, which means they are pretty attached to it. So as you are writing your thank you notes, and taking the time to thank your employees for all that they do all year, remember that one little detail that will truly communicate how much you care about them: Use their (correct) name. 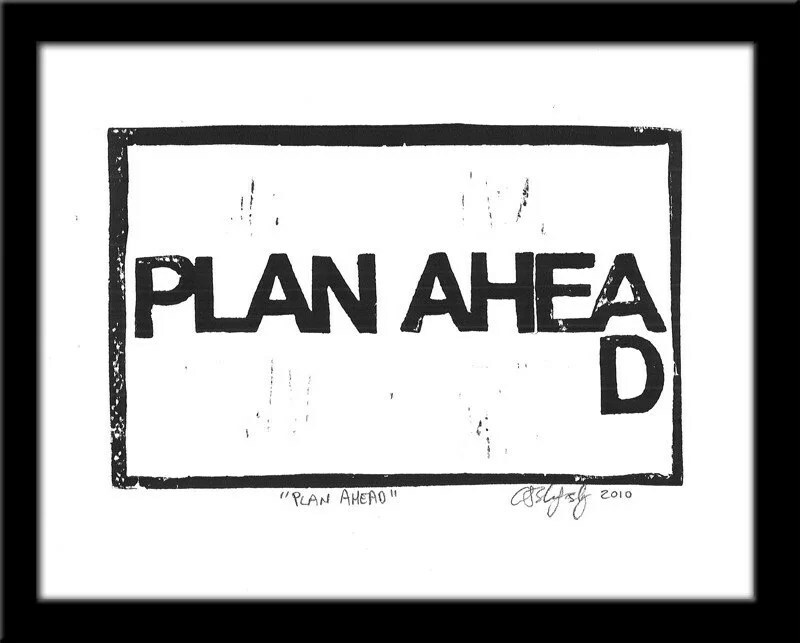 Failing to plan ahead means that often we also don’t look ahead to see what’s coming. This thought hit me (not literally) as I was riding my bike through a residential part of town recently. As I approached a driveway, I slowed down and peered through the tall hedges to make sure a car wasn’t coming. That made me think of a leaders role in looking ahead to prepare his or her team for what might be coming next. This then brought me back to my early days as a leader in a seasonal amusement park. We used to do the schedule a week out, so that’s about as far ahead as I was thinking and planning. In conversations I’ve had with some other young leaders recently, I’ve seen that the trend still continues. To me what this suggests is that the act of planning ahead gets us in the habit to look ahead… but don’t we need to look ahead so that we can plan ahead? Oh, my head. In fact, looking ahead and planning ahead might sound similar, but they are different. And yes, interconnected. Looking ahead – being aware of and anticipating what will be happening, whether on a schedule or from previous experience. Looking at forecasts (weather, attendance, events, etc) that help you prepare yourself and your team. Planning ahead – figuring out how to deal with all the things that are coming up so you don’t have to scramble when the time comes. Looking ahead is a habit and it takes time. The process of being able to do this is also cyclical. If you are spending all of your time putting out fires and dealing with (presumably preventable) “emergencies”, then you will not have time to look ahead and will be stuck in that cycle. At some point you have to break free and find the time to look ahead so you can plan ahead. If you work in seasonal business, the off season is a perfect time to work on breaking this cycle. Take a look at the things you had to deal with last season, look ahead to see if those will be issues again (they will) and plan accordingly. If you work at a year round business, you may just have to draw a line in the sand and start looking ahead. Look at what will be happening at your place in 3 weeks, 3 months or even a year. What can you do now (or start doing now) that will help you make that time frame a success and less stressful? When I was working at a small year round FEC, this meant knowing what days the kids were off from school so we could staff accordingly. It sounds simple, but knowing that one piece of information a few weeks in advance helps make sure you are ready for it, and saves you the panic and angst of calling in additional staff or running the bumper boats. It may take some extra time in the beginning, but it will be will be well worth it when you can work your plan and not spend your time putting out preventable fires. If you look ahead and find that you need ways to build your teams or increase the productivity of your leaders, let me know. I can help you with that plan! In a previous position, I was responsible for ensuring that the proper safety training was completed for a large department within a large company. I didn’t necessarily perform the training itself, so much as serve as a liaison between the people who needed the training and the people who offered the training. In other words, I had to make sure the right butts were in the right seats. Taking this as a compliment, I wanted to pass along the kudos to the person responsible for scooping up all those seats. Her name is Nikki, and she took it as a compliment, too. She was proud to be called a vulture, because it meant she was doing her job and someone noticed. It didn’t matter that her actions were being compared to a roadkill-clearing scavenger, what mattered was that there was an acknowledgement, a recognition for what she had accomplished. She may have been toiling away quietly at her desk, doing her job to the best of her ability and hoping it was creating a positive outcome. And then someone noticed and they cared enough to mention it. And Nikki started scooping up the seats even faster! I ran across a similar example from some friends in a call center environment. The goal was efficient calls and resolution, and each call was timed. The person with shortest call time average got a little Hot Wheels race car to put on their desk. The person with the longest call time average got a little toy turtle. They said you would not believe the buzz and friendly competition that erupted in the center because everyone wanted that car and no one wanted the turtle. I think we can sometimes get too wrapped up in WHAT or even HOW we are going to recognize an achievement (before it even happens) that we lose sight of WHY we are recognizing. I think the vulture status was motivating to Nikki because it was directly related to something specific she had done. And WHY do we recognize? Because we want people to know that they are doing the right thing so they will keep doing it. The folks at the call center increased efficiency and satisfaction because they wanted a little toy car on their desk. Bragging rights. Acknowledgement – they need to know that way they did meant something to someone. Sincerity – the acknowledgement has to be real, and it doesn’t have to be expensive to be real. Personal – Nikki was the Training Vulture. No one else could take that title. It was hers because she earned it. Ever wondered what I do when I am not writing blog posts? You can find our here: What Matt Does. How handy is that?